In 1706 a sect of expatriate French Protestant holy rollers arrived in London. Called “Camisards”, they were more familiarly known as the “French Prophets”. Their preaching, prophesying, and speaking in tongues to assembled crowds caused quite a stir, and they were viewed by the government as a threat to public order, or at least as a public nuisance. T’inveigle and draw in the Rabble. O’th’ younger house to Puppet-play. Indeed, a response to Shaftesbury’s Letter, written by Mary Astell (more on her later), was entitled Bart’lemy Fair: or an Enquiry after Wit (1709). 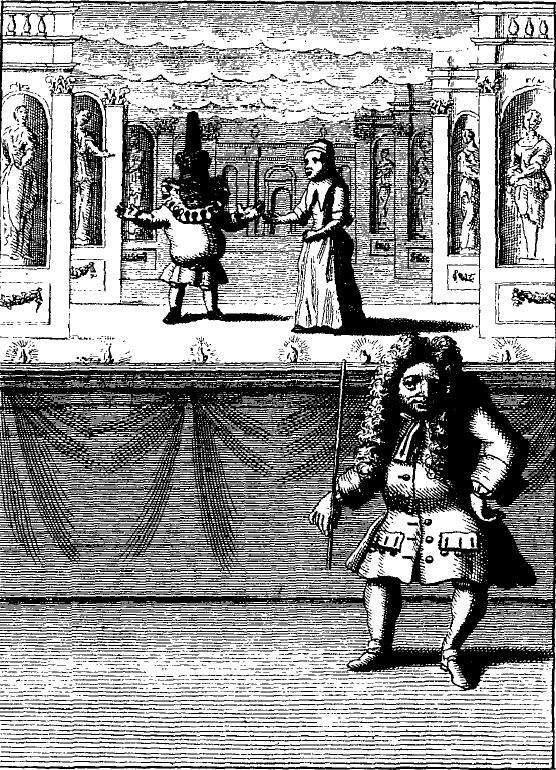 Much later, Anthony Collins, a freethinker and acquaintance of Shaftesbury’s, alluded to the whole incident of the Prophets and the puppet shows in his A Discourse concerning Ridicule and Irony in Writing (1729) when he wrote: “I don’t know whether you would be willing even to restrain Barthlomew Fair, where the Sect of the New Prophets was the Subject of a Droll or Puppet-Show” (p. 29). In the passage from Shaftesbury quoted above, the puppets have “strange Voices” animated by pipes. It is tempting, by connecting this to Shaftesbury’s subsequent mention of “passive organs”, to assume he is making some kind of lame pun on the musical instrument. I do not believe this is the case. Rather, I think he had in mind bagpipes rather than a pipe organ. One commonly finds in the 17th and 18th centuries references to a peculiar nasal intonation — supposedly a kind of droning sound — made by Puritan preachers (often disparagingly referred to as “fanatics” or “Saints”). This tone was often compared to bagpipes. The lowdest Bagpipe of the squeaking Train. Similarly, in Jonathan Swift’s A Discourse concerning the Mechanical Operation of the Spirit (1704), Section II, appended to A Tale of Tub (1710 ed. ), Jonathan Swift writes: “By this Method, the Twang of the Nose, becomes perfectly to resemble the Snuffle of a Bag-pipe, and is found to be equally attractive of British Ears; whereof the Saint had sudden Experience, by practicing this new Faculty with wonderful Success in the Operation of the Spirit” (p. 333). Historian David Hackett Fischer, in his Albion’s Seed: Four British Folkways in America (1989), referred to this sound as being a characteristic speech pattern of the New England settlers. He, like Swift, also refers to it as a nasal “twang”. Fischer’s explanation is that the New England settlers were, as we know, Puritans, and that a disproportionate number of them came from the Puritan hotbed of East Anglia, where this linguistic quirk was indigenous. I don’t know if it still is; I have spent time in places like Suffolk and haven’t really noticed it. Whether or not it still exists, it was doubtless a real thing in the early 18th century, judging by the frequency with which it was remarked upon. To be honest, I can’t quite get an image of this peculiar sound in my imagination, a sound that was at once a “twang”, a “drone”, a “snuffling”, and a “squeaking”. Enough about bagpipes. Let’s return for a moment to Swift. As mentioned, Swift wrote A Discourse concerning the Mechanical Operation of the Spirit. In it, and in his Tale of a Tub more generally, he writes of the French Prophets, and of such other fanatics as were under the influence of what was then typically called religious “enthusiasm”. Their gestures, motions, and voices while thus influenced were odd, as if they were not entirely in control of themselves. Hence, the comparisons to puppets, to machines, or to musical instruments being played upon by extraneous forces. These same comparisons are to be found in Shaftesbury’s Letter concerning Enthusiasm, and expressed in a quite similar style. These similarities were not lost on Swift. In the “Apology” prefacing the 1710 edition of A Tale of a Tub, he writes: “Yet several have gone a farther Step, and pronounced another Book to have been the Work of the same Hand with this; which the Author directly affirms to be a thorough mistake; he having yet never so much as read that Discourse, a plain Instance how little Truth, there often is in general Surmises, or in Conjectures drawn from a Similitude of Style, or way of thinking.” In the margin, Swift identifies this other book as the “Letter of Enthusiasm”— Shaftesbury’s book. Both Swift’s Tale and Shaftesbury’s Letter were dedicated to the Whig grandee John, Lord Somers, a circumstance that might have contributed to a confounding of the two writers in the minds of readers. Their identification in some minds is perhaps exemplified by the case of Mary Astell. 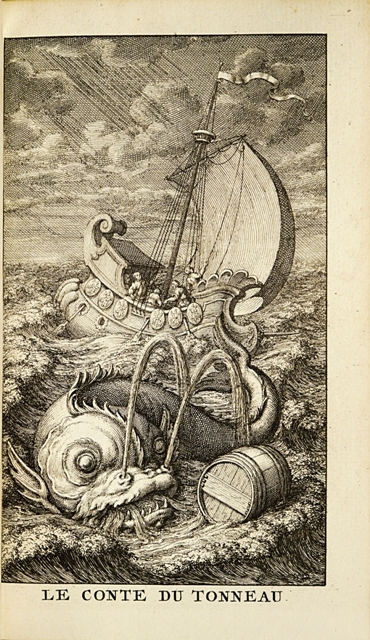 In 1704 Swift wrote The Battle of the Books, a satire on the then-raging controversy between those who defended the ancient writers as superior to the moderns, and those who sided with the moderns over the ancients. In it, scholar William Wotton was satirized — along with others — for his pedantry, Wotton having defended the moderns against Swift’s old patron, Sir William Temple, champion of the ancients. In 1709 there appeared a response to Shaftesbury’s Letter concerning Enthusiasm, entitled Bart’lemy Fair: or an Enquiry after Wit. This work bears Wotton’s name on the title page, but it was actually written by Astell. Hiding behind Wotton’s name was an indication that Astell thought the Letter concerning Enthusiasm was by Swift. She also takes an opportunity on page 97 of Bart’lemy Fair to attack A Tale of a Tub, which would seem out of place if she thought the author of the Letter were anyone other than Swift. Finally, there is the matter of Bart’lemy Fair’s subtitle, which in the original 1709 edition is “in which due Respect is had to a Letter concerning Enthusiasm to My Lord ***. By Mr. Wotton.” A second edition of the work was published in 1722, for which the subtitle had been changed to “Wherein the Trifling Arguing and Impious Raillery of the Late Earl of Shaftsbury, in his Letter concerning Enthusiasm, and other Profane Writers, Are fully Answer’d and justly Exposed.” In 1709 there would be no reason to expect Astell to know that Shaftesbury wrote the Letter. Swift himself doesn’t seem to have known. However, by 1711 she would have discovered its authorship, once it was included in the first edition of Shaftesbury’s Characteristicks of Men, Manners, Opinions, Times, the authorship of which was well-known. Hence, on the title page of the 1722 edition of Bart’lemy Fair Shaftesbury is named. It must have rankled Shaftesbury to be confused with Swift. I do not know if the two men ever met personally; although it’s not impossible, I haven’t come across any evidence for it. However, if they didn’t meet, one wonders where the former developed his visceral and very intimate-sounding dislike of the latter. According to a letter to Lord Somers, Shaftesbury had read A Tale of a Tub as early as October 1705. He was not a fan, for later, in 1712, he writes to Pierre Coste: “Witness the prevalency and first success of that detestable writing of that most detestable author of the Tale of a Tub, whose manners, life, and prostitute pen and tongue are indeed exactly answerable to the irregularity, obscenity, profaneness, and fulsomeness of his false wit and scurrilous style and humour.” Did Shaftesbury hate the man, or did he hate that he had been confused with an author who in the intervening years had turned Tory? The 1708 Letter concerning Enthusiasm was not the last time the two authors would cross paths (or swords) in the public sphere. By 1711, when Shaftesbury’s Characteristicks appeared, he and Swift found themselves on opposite sides in Britain’s increasingly polarized political climate. Shaftesbury was a Whig, and hence supported war with France. Speaking of the gradual rise and improvement of the arts in Britain, Shaftesbury wrote, “‘Tis with us at present, as with the Roman People in those early Days, when they wanted only repose from Arms to apply themselves to the Improvement of Arts and Studys” (Characteristicks, Vol. I, p. 223). The following year, Swift, now a confirmed Tory, took an opportunity of attacking Shaftesbury for these words in his Proposal for Correcting, Improving and Ascertaining the English Tongue (1712). The work was dedicated to Tory grandee Robert Harley, Earl of Oxford and Earl Mortimer, who was Queen Anne’s chief minister. Swift writes, “I was glad to find Your LORDSHIP’s Answer in so different a Style, from what hath been commonly made use of on the like Occasions, for some Years past, that all such Thoughts must be deferred to a Time of Peace: A Topick which some have carried so far, that they would not have us, by any means, think of preserving our Civil or Religious Constitution, because we were engaged in a War abroad” (pp. 6-7). In other words, it is the Tories, under Harley, who can be counted on to nurture the arts and belles lettres in England, not warmongering Whigs like Shaftesbury. Back to the puppet shows. I have no desire to bore you with the details of the particular church controversy (the “Bangorian controversy”) that gave rise to the letter. For my purposes, the letter is interesting for two things. First, although this Tatler postdates Shaftesbury’s Letter concerning Enthusiasm by a year, it shows that the puppet metaphor could be used against the High Flying Tories as well as against the Dissenting fanatics such as the French Prophets. Second, it introduces us to a curious character in the backwaters of English culture in the Augustan period — Martin Powell, puppet master extraordinaire. In 1709 he was based in Bath and his show toured the provinces, but obviously he had become well-known enough that his name was familiar to London audiences. With an eye on the main chance, in 1710 he made the move to London and set up “Punch’s Theatre” in St. Martin’s Lane. A year later the theatre moved to Covent Garden. It was here that the visionary Mr. Powell decided that puppets could be much more than mere instruments of low comedy, and so he began to stage puppet versions of the highbrow plays and Italian operas patronized by the beau monde. Muscling in on this market made him the object of ridicule in “up market” papers like the Spectator (see, for example No. 14, 16 March 1711), but nevertheless, audiences flocked to him. His sets and puppets were elaborate mechanical contrivances, so much so that references to “the ingenious Mr. Powell” were much more common than references to “Mr. Powell the deformed cripple puppeteer”. 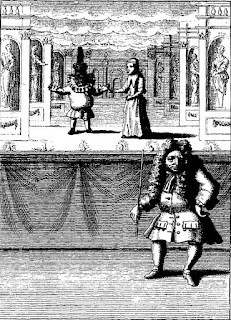 For example, in 1714 there appeared an anonymous book entitled A Second Tale of a Tub: or, the History of Robert Powel the Puppet-Show-Man, written by Sir Thomas Burnet. In it, Burnet writes, “have not even the Orcades, the utmost limits of CAESAR’s Conquest, been filled with the Fame of Mr. POWEL’s mechanical achievements?” (p. xxiv). Burnet’s book is a rather lame attempt at political satire, trading on the fame of Powell but changing his first name from Martin to Robert, to make him represent Robert, Lord Harley, whom we have already encountered in relation to Swift, above. The hamfisted conceit of the book is that Harley is a sort of political puppet master, “the Celebrated Mr. POWEL, the Puppet-Show Man, who has worthily acquired the Reputation of one of the most dextrous Managers of human Mechanism” (p. xxvi). A Second Tale of a Tub has a frontispiece with a representation of Martin Powell (shown above). In it, his physical deformity is evident. However, I am inclined to think that the face is not that of Powell but rather of Lord Harley. But I could be wrong. We have no other portraits of Powell with which to compare faces, and the engraving is not particularly detailed or well-executed, so any vague resemblance to Harley’s portraits may be purely accidental. There is one thing about Powell’s story that puzzles me. According to his entry in the Dictionary of National Biography, “When the fanatics called French prophets were creating disturbances in Moorfields, the ministry ordered Powell to make Punch turn prophet, which he did so well that it soon put an end to the prophets and their prophecies.” As far as I can tell, this story seems to derive ultimately from an anecdote told by Lord Chesterfield, who would have been a child at the time of the event. First, Shaftesbury was writing in 1707, but most sources place the event in question in 1710, or in Lord Chesterfield’s words, “about the end of Queen Anne’s reign”. Second, in 1707 Powell was supposedly still in the provinces, only coming to London in 1710. (ii) the incident was real but the puppets were not Powell’s. On the other hand, I suppose it is also just possible that the incident was real, that the puppets were Powell’s, and that it took place in 1707. After all, none of the sources for Powell’s life say he never went to London before he moved there permanently in 1710. Indeed, it would be strange for him not to have gone there, at least to take advantage of Bartholomew Fair. Maybe that's how he made an advance name for himself in the city. And in any case, there is little reason we should trust Chesterfield’s memory for the details of an event that supposedly occurred when he was but a child. Finally, by 1710, the fuss over the Prophets had waned, thereby obviating the need for the ministry’s measure. These circumstances make it less nonsensical to assign the event to 1707. I hope I’ve managed to toss you enough tubs for your diversion.